Medic to Medic is a UK-based charity that sponsors disadvantaged students training to be healthcare professionals in Malawi and Uganda. Since 2007, we have helped more than 35 students qualify as health workers in their home country. Last year we started our latest programme, sponsoring nursing students at Mzuzu University, in northern Malawi. Acknowledged by the World Bank as the poorest country in the world, Malawi has a population of 16 million, the vast majority of whom live below the poverty line. Malawi’s critical shortage of health workers – it has only 59 nurses per 100,000 people, compared to the UK’s 900 – has a negative effect on many patient outcomes, and it remains one of the most dangerous places to live for women and children. 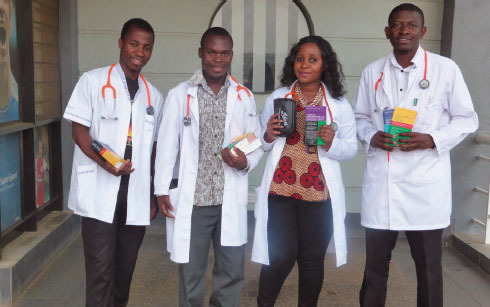 For nursing students at Mzuzu University, tuition fees are about £500 a year – an insurmountable amount for many students from poor backgrounds. Around ten students a year are forced to drop out because they cannot afford it – ten future nurses Malawi will not benefit from. Medic to Medic wants to cut this number over coming years through student scholarships. These will guarantee payment of the students’ tuition fees and provide them with a twice-yearly stationery and living allowance. Students will also get books, equipment and a laptop to help them reach their full potential. Our first nursing student, Manasseh Nyrienda, always wanted to be a nurse. The eldest of six siblings in a single parent, single income family, he struggled through his first two years at Mzuzu because he was constantly trying to find the money to pay for his education. Sponsorship has enabled him to concentrate on his studies, rather than funding. ‘People die due to poor services, and I want to help fill the gap,’ he says. Medic to Medic started out supporting medical students, so most of our 100 regular UK donors so far have been doctors. Now that we have expanded to include nursing students, we want to get more UK nurses involved. Regular donors can give anything from £3 a month towards training a nurse in Malawi. Medic to Medic then matches you to one of our nursing students and send you information and twice-yearly updates so you can see how your support is helping them. We can also help donors communicate with their student via email. Medic to Medic is funded by regular donations, grants and fundraising through our student groups based at universities in the UK. On our last visit to Malawi, we distributed eight boxes of nursing books donated by the University of Hertfordshire. The resources at Mzuzu University are sparse, and any donations towards building up the skills lab is of huge benefit to students. If we find that a student is struggling, we try to match them with a mentor to provide additional support, and we need more UK nurses to act as mentors to students in Malawi. Mzuzu University deputy head of nursing Thokozani Bvumbe says: ‘When a student gets the education, it breaks a big poverty chain in their clan. ‘Through student support, you would have helped thousands of patients who could have died due to lack of trained personnel in hospitals’.